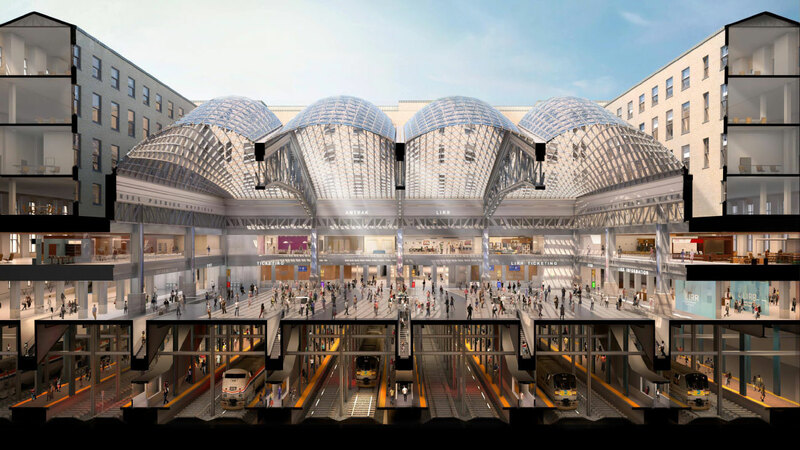 As New York State’s 2018-2019 budget negotiations come down to the wire, Governor Andrew Cuomo‘s office has reportedly slipped in a proposal that would give the state virtually unrestricted development authority over the area surrounding Penn Station. According to the anonymous sources who briefed Politico yesterday, if passed, the state would gain the ability to build without restrictions on height or density, the need to conduct any environmental review, or to win community approval. The Cuomo administration has previously played a major role in the redevelopment of the Penn Station area, including backing the transformation of the James A. Farley Post Office into the Moynihan Train Hall. While the city has reportedly been in talks with the MTA and developers Vornado Realty Trust, who own much of the property surrounding Penn Station, Wednesday was apparently the first time that any party outside of Albany had seen the proposal. When reached for comment by Politico, Cuomo spokesperson Peter Ajemian suggested that their reporting on the day-old plan was already outdated. The governor’s office has suggested that the original broad outline was simply a starting point, and would likely be narrowed down in the back-and-forth as budget negotiations continued. Still, with Governor Cuomo’s self-imposed March 30th deadline looming, it’s unclear if the plan will make the final cut. The full version of the leaked document can be found here.